Cook lots of onions gently in olive oil. Add stock and white wine. 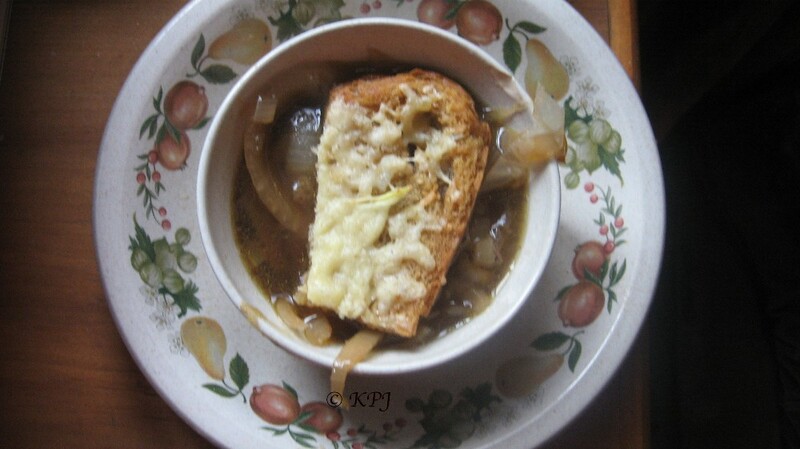 I used plain yeast extract for stock as it gives a good strong flavour to complement the sweetness of the onions. The wine was whatever was kicking around in the fridge, a Pinot Grigot on offer at Morrisons for around £4 I think. It doesn’t need a lot, say a glass? Cook bread in oven. This is important. Do not use toast. Cooking it gently in the oven dries it out and crisps it up without browning it like toast. Chuck a couple of slurps of olive oil onto bread. I was using a brown bread, so it prevents it drying out too much, and rapidly absorbs the oil and the flavour. Put back in oven for the cheese to cook slightly and then add to bowl of soup. Either on top, or at the bottom and pour soup on top of tasty toastie. Other options are to add brandy (which we never buy), or an egg liaison or even more cheese and finish the whole lot under the grill.